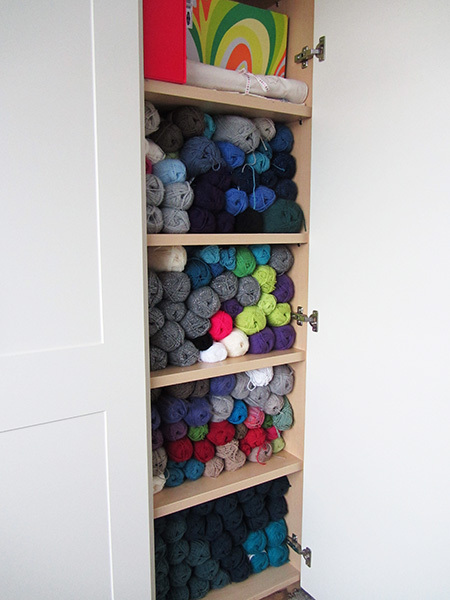 Please take a look at the image above: this is a picture of my newly organised knitting stash and tools. Doesn’t it draw you to these two conclusions: 1) I own an unhealthy amount of yarn ; 2) I have a soft spot for blues and greys. Yep, that’s the problem with organisation: it gets people look at things as they are. As soon as I was done, my first move was to make a new new year resolution: knit at least two of these shelves before I buy any new yarn. I first thought I would order them by colour but it would have taken ages, so I stuffed them on the shelf as I could. But at least now it is all accounted for: I am in the process of adding all these babies to my Ravelry stash, just as I did for my needles and hooks. And look at the top shelf: here live my pattern and circular needles binders, my straight needles organiser and my red box (aka: bits and bobs knitting box) where I store waste yarn and other notions. Readers, this is a great step for craft organisation in my humble house. What a lovely healthy stash! Mine are kept in hampers stored all over the house! I was the same but thought I would be more able to see what I have by putting all ion one place. I didn’t suspect I had so much! Great cupboard! So what are you planning on knitting? All very organised! Look forward to seeing your finished objects. (no pressure or anything! ).